Care Packages for Soldiers: Soldiers Receive Texas Themed Care Packages. 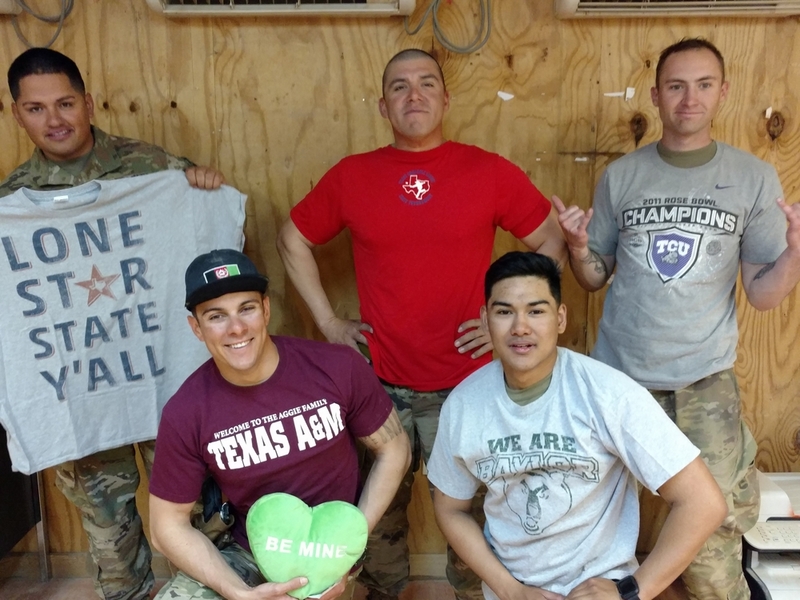 Soldiers Receive Texas Themed Care Packages. Here's another thank you note and a picture from some soldiers who received the "Greetings from Texas" care packages we mailed in March. Texas themed items, t-shirts, pinatas, chips and salsa as well as the regular items of toiletries and snacks were included in the boxes. The flaps of the boxes were decorated with "love notes" which were as big a hit as were the t-shirts. We've been receiving some of the larger boxes every few days from your last shipment. Our guys are overjoyed by it all. Attached is a picture of a few of my Soldiers sportin' some TX gear! Guys have even been cutting the boxes up and putting the pictures yall draw on the inside in their rooms. Its been a lot of fun. Please send our thanks and love to everyone in your organization. We posted your website link on our closed Family Readiness Group website so family and friends have the opportunity to donate to yall. I hope this note finds you well and that you have a wonderful day!